GP Lithium Coin battery possesses remarkable features including long shelf life of 10 years, high energy density, flat discharge voltage, wide operating temperature and excellent storability with low self discharge rate. 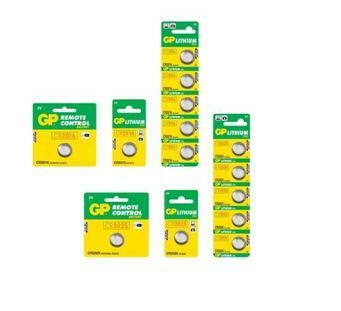 GP Lithium Coin batteries are the perfect power partner in your everyday life. Calculators; Car Equipment; FA Instruments; Electronic Thermometers; IC Cards/Tags; Memory Back-Up; Greeting Cards, Time Pieces, Remote Control; Portable Games, etc.